What adjustments increase sale price the most? How do I attract the best buyers? What mistakes should I avoid at all cost? While it’s important to take seasons and cycles into consideration, the selling timeline is just as important when it comes to producing maximum sale value. Sellers that are looking to close the sale within a few months often end up sorely disappointed. As a rule, the eventual sale price increases with each extra month of lead time. History suggests that an ideal timeline is 18-24 months. The average sale takes nine months to close. Rushing often leaves money on the table. If you display a clear urgency to sell, buyers will often catch on and lowball you accordingly. It allows a broker time to find ideal matches for you. The more quality bids that can be rounded up, the more the business will sell for. Taking the time to prep your business before listing it can allow for significant corrections and improvements. 2. What to change before you sell. The law of entropy says that organizations tend to become less efficient over time. Things have a way of growing a bit slack in even the best businesses. Before listing to sell, it’s important to do a top-down review and optimization. Creating a written marketing plan. Documenting all key policies and processes. Checking paperwork to ensure accuracy. Reviewing staff position descriptions and performance. Organizing and/or upgrading the physical property. Just like renovating and staging a house increases its sale value, these adjustments can make a significant difference on what your business sells for. 3. How to attract great buyers. There are few ways of going about lead-generation. They are not equal. Basic listings. There are plenty of free print and online listings that you can take advantage of. While they can be of some use, they suffer from the “kijiji syndrome” (i.e., they’re primarily browsed by buyers who are price-sensitive and shopping solo). While these listings can generate a lot of interest, they don’t tend to produce many high-quality offers. Network tapping. Who do you know that might have a natural interest in your business? (Possibly someone who would see it as value-adding acquisition.) Who do you know who might have that person in their network who can make a connection for you? Direct solicitation. In some cases, it can be worthwhile to have someone (confidentially) approach potential buyers on your behalf. When in doubt, ask yourself the golden question: “If I was a qualified buyer, how would I go about searching for opportunities?” Make sure your plan matches. 4. How to not sell a business. 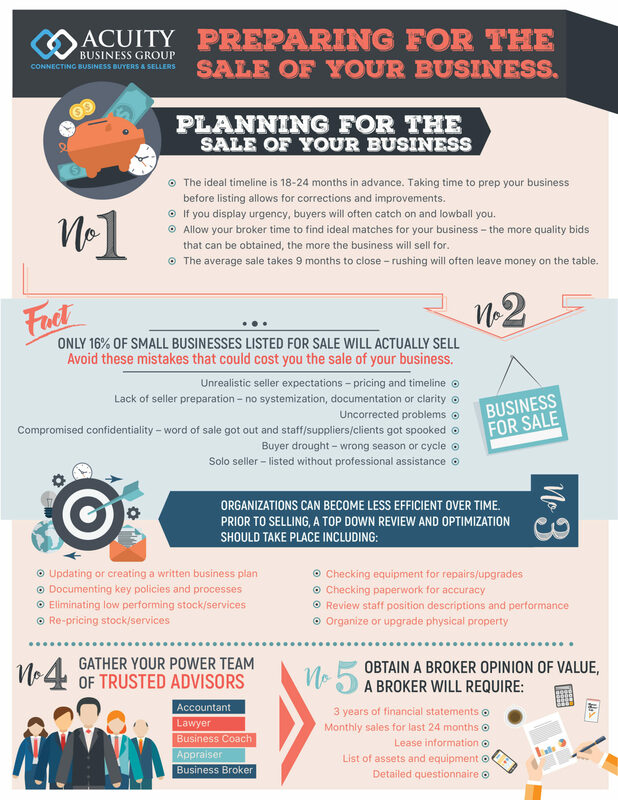 On average, only 16% of small businesses listed for sale will actually sell. That’s not a typo. That’s a cold reality. Seller expectations. Unrealistic pricing and timelines. Seller preparation. Lack of systemization, documentation, or general clarity. Owners were often selling their job, not an organized business. Uncorrected problems. Fundamental shortcomings not identified and/or meaningfully addressed. Compromised confidentiality. Word of the sale got out. Staff, suppliers, and/or clients got spooked. Buyer drought. Wrong season or cycle. Sometimes the best plan is to wait and use the interim to work on growing and organizing the business. Solo seller. They listed without professional assistance on valuation, marketing, negotiations, screening, etc. Want to avoid becoming a statistic? Contact us to conduct a selling-plan audit. We guarantee that you’ll leave with fresh perspective and a list of action-steps to increase your ultimate valuation.